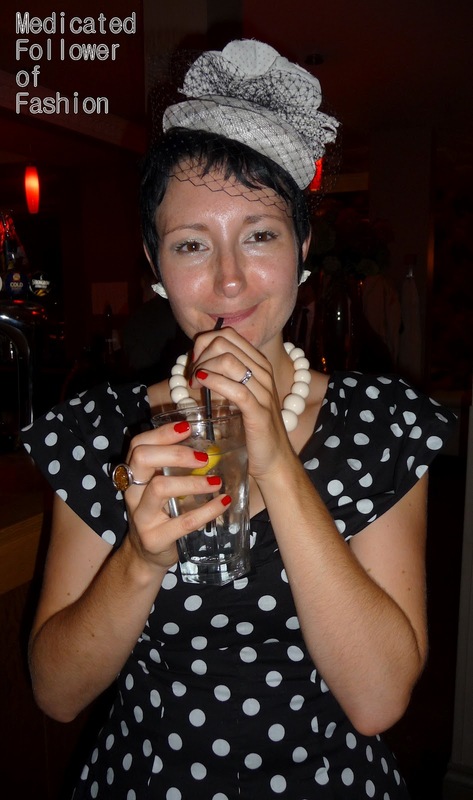 Medicated Follower of Fashion: My favourite vintage style dress..
Hello lovely readers! I do hope this weekend treats you well. Let's all keep our fingers crossed for some good weather! I'm writing today about a subject dear to my heart. Yup! Dresses.. or one dress to be specific. I have recently found out about a challenge being run by M&S, the "Very Vintage Dresses Challenge". To enter, all I have to do is choose a favourite dress of mine which is either vintage or vintage in style. Now, I do own a few "old" dresses, but they mostly date from the '70s, and though I'm very fond of them, they aren't my favourites... No, my favourite style of dress is definitely 1950s in style. I would love to own an original '50s dress, but for now, I make do with dresses "in the style of". It's quite hard for me to pick a favourite.. I own a lot of dresses but there is one that sticks in my mind. The dress I've picked is quite special. I bought it to wear to my friend's wedding, so it reminds me of happy times, of being with friends, celebrating, dancing etc. It's quite classic, black with white polka dots. It suits my shape and with a net skirt underneath I feel like a very flirty million bucks! I bought the dress in a boutique in Bristol and it only cost me £22. A total bargain because it's handmade! The fit is divine. I would class it as '50s in shape and style, but the skirt is shorter than dresses of the '50s would have been I feel... Perhaps that puts me in some sort of 1950s harpie class, I'm not sure.. So, let's call it "modernised '50s". 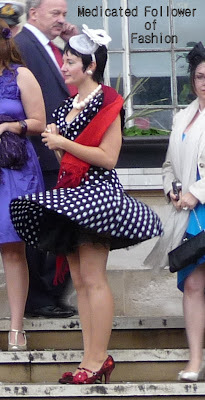 I know I feel like I'm at the prom with my net skirt underneath, spinning around in this dress makes me grin from ear to ear, and when it catches in the wind there's always a Marilyn moment! Now, M&S would like us bloggers to share which dress from the current M&S range would stand the test of time, which dress would get brought out year upon year, time and time again... Well, again this was a tricky challenge!! M&S stock hundreds of dresses and many of them are very classic in style and colour.. having spent a great deal of time looking at their range though, I'm going to plump for the "Pleated Neckline A-line Dress". This classic dress comes in two colours; black (LBD or what?!) or magenta (the current colour of my hair and a bit more loud!). It's simple but with eye-catching detail on the neckline. The a-line cut makes it flattering on so many body shapes. I could see this dress as smart office wear, dressed up for a wedding, glammed up for a Christmas party or teamed with a cardi and flats for a day dress. Very versatile! In my book, a classic in the bargain price of £35! LOVE your polka dot dress - and the petticoat underneath it - FAB little detail! Yes, It is indeed a lovely dress and you look great in it!